The largest cemetery of Revolutionary War soldiers in America lies roughly five miles from the Hudson River, beside a commercial stretch of Route 9 in Fishkill, N.Y. What was once a 70-acre military city and the Continental Army’s largest supply center now hosts a Blimpie, a McDonald’s, and a Godfather’s pizza. The old headquarters for Washington’s generals is a small museum, but most of the site’s original history has been forgotten. A contract archaeologist named Bill Sandy found seven graves in 2007 while surveying the land for commercial development, and later studies found evidence of hundreds more graves. Sandy has partnered with historic preservation societies that hope to buy the land and commemorate the site. But for now the area is in a state of limbo, partially developed and partially preserved. Sandy is one of the many archaeologists Marilyn Johnson profiles in her globe-spanning new book, “Lives in Ruins: Archaeologists and the Seductive Lure of Human Rubble.’’ But he is a good representative of a common type: scruffy, knowledgeable, underpaid, and admirably dedicated to deciphering and preserving faint traces of past human cultures. Johnson’s book divides into sections with titles like “Boot Camp,’’ “The Classics,’’ and “Archaeology and War’’ and is simultaneously a crash course in basic archaeology and a sociological study of the various quirky subcultures of professional archaeologists. Both types of material prove fascinating, and she is a funny and garrulous guide to the terrain. Her story moves from the historical archaeology of the Caribbean (think ruined rum factories and archaeologists fleeing killer bees) to the hunters of the middle Paleolithic (picture a professor butchering a goat carcass with an obsidian blade to simulate ancient hunting practice). She also roams from Machu Picchu to South Dakota to Cyprus on her quest to study archaeologists and their work. But the profession’s admiration for the swashbuckling hero that Harrison Ford depicts in the Indiana Jones movies is somewhat tongue-in-cheek. For one thing, what Indiana Jones considered archaeology, archaeologists today would consider looting. They repeatedly tell Johnson that what matters more than obtaining artifacts is carefully analyzing their context in a landscape. Simply plucking an ancient pot from the ground destroys more information than it reveals. Actual archaeologists also spend more time in laboratories and libraries than fighting the natives where they excavate. The meticulous analysis of slight gradations in soil color and the study of chemical residues on cooking vessels might not make for gripping cinema, but these are essential parts of archaeology. But adventure and romance are also undeniable features of the profession, and Johnson artfully suggests the evocative lure of human rubble. Some of the archaeologists she profiles are nearly destitute; passion drives them. Diving beneath the waves of the Atlantic to find the sunken vessel that first discovered Australia, for instance, offers a thrill few professions can match. Extracting bone grease from bison to approximate the diet of paleo-Indian hunters in the Americas is also something you don’t get to do at most jobs. 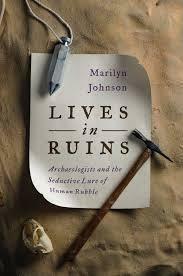 Johnson skillfully captures the vivid and quirky characters drawn to archaeology. One woman tells her that she has buried 45 rats in her backyard to study the process of decomposition. Another archaeologist confides that she once received an old human skull as a gift from her archaeologist husband. She was delighted.